Now Bryce and I had both been to Whitehaven Beach before. My last visit there was about 7 years ago and Bryce hadn't been there for 20 years but for both of us this signified "The Whitsundays" so making it here was making it north! After not being able to leave last year, we were pretty keen to get going. We were so focused on "getting north," that was our only objective. So... We were pretty happy. The gorgeous pristine white sand stretching for miles is hard to beat. The downside to this being one of the more popular tourist destinations was that there were so many other boats anchored there as well and when the tour boats brought even more people in multiple times a day, it kind of lost it's appeal. We spent a morning making a repair on out sail. We had tried to do running repairs a couple of days prior on the way up but they didn't hold. 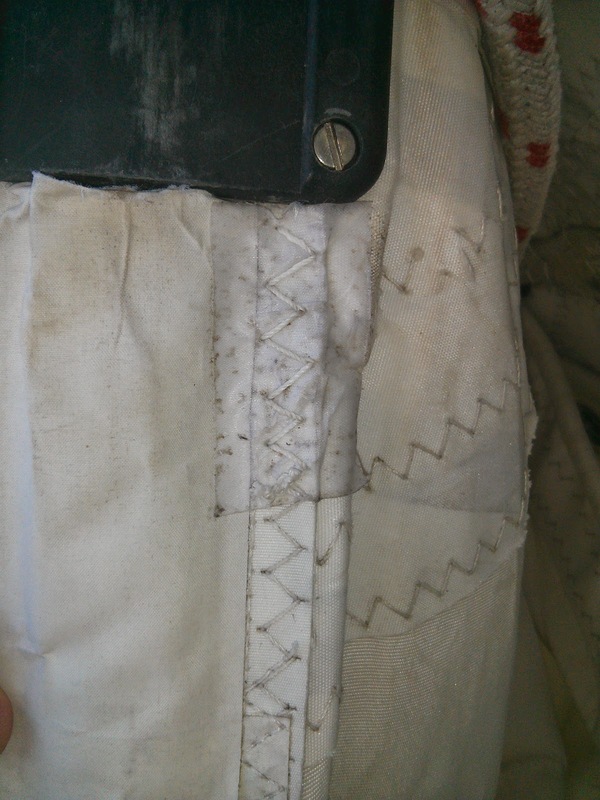 One of our battens (sticks through the mainsail that help it keep some shape when sailing) had torn through it's pocket and was chafing on all sorts of things on the mast. It was our first sewing repair and it turned out pretty OK I think! We enjoyed our walks on the beach and the hiking that leaves from there but we were ready to move on. The day after we got there we upped anchor to leave, taking the scenic route along the beach to leave. When we got to the northern end of the beach, the sand was whiter (if you can believe it! ), the water was clearer and there were no people! Win! So back down the anchor went for the night. From here we headed up to Blue Pearl Bay. It was an easy, breezy, relaxing sail. 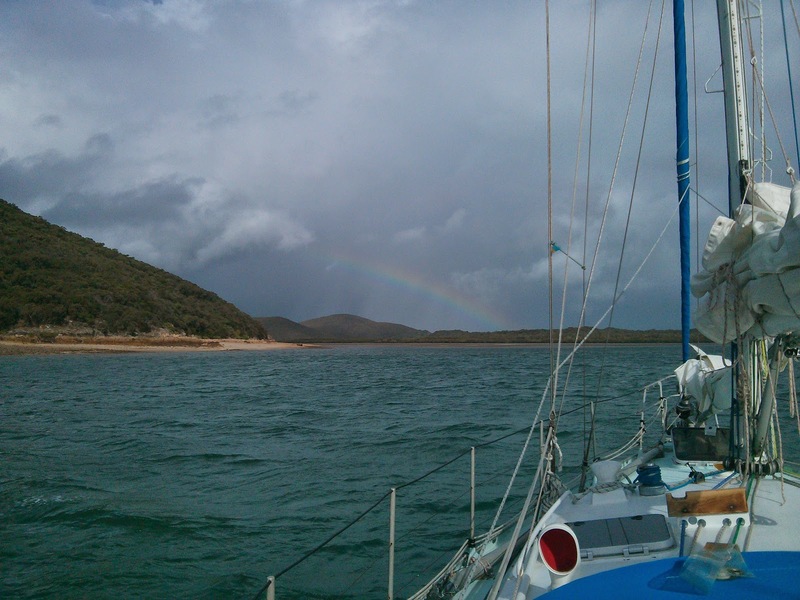 It is clear to us why this is such a popular destination for sailing. We made it up to Blue Pearl Bay and picked up a mooring buoy just in time to say adios to our Welsh friends heading north on their Catamaran. This was our first time on a Cat and it's a different life then that on a monohull. Blue Pearl Bay is located on Hayman Island, that of the resort and again just another stunning place. The water was crystal clear and so deep but we could see the large parrot fish swimming around underneath our boat. The snorkeling there was stunning. Now at this point we had been planning on heading into Airlie Beach to resupply, do some laundry and get rid of our rubbish. 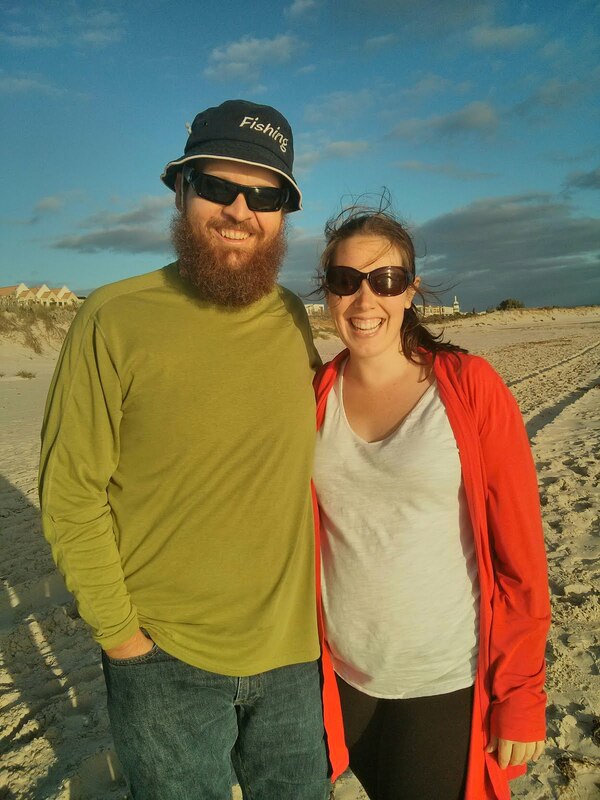 It had been three weeks since we had left Bundaberg and seen civilization. 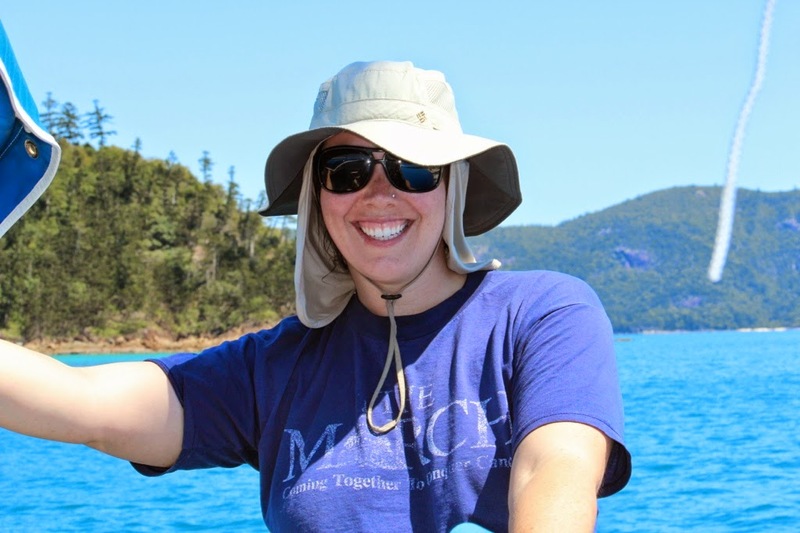 We probably could have gone longer and we were pretty keen to get some fresh food but.... we had some friends, Michael & Caitlin, who had just left Airlie and headed up to Gloucester Island. They somehow convinced us to head up to join them and we are very glad we did! 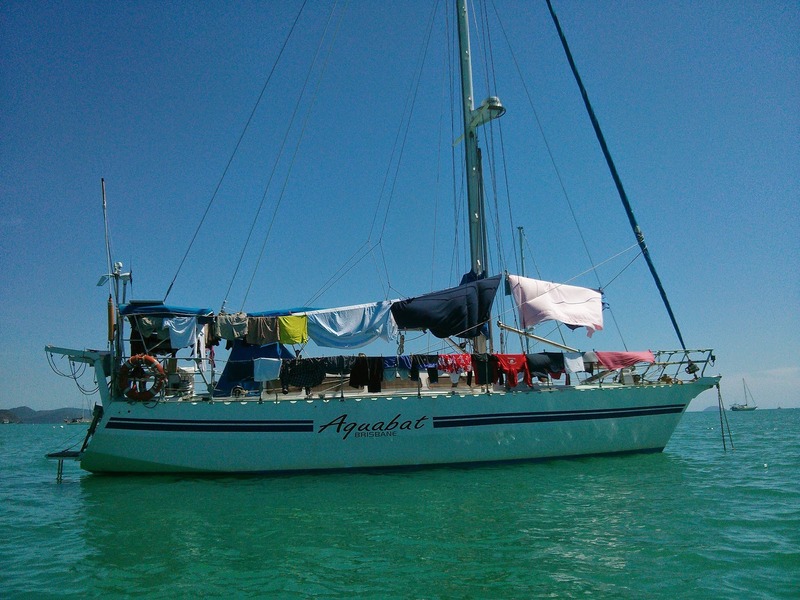 We had a quick stop (<18 hrs) at Airlie Beach to resupply and so some laundry and then we were off again. Our trip up to Gloucester Island was bonus. We had never planned to go further than Airlie Beach. This was a bit of a leap of faith seeing how we had never actually met before. 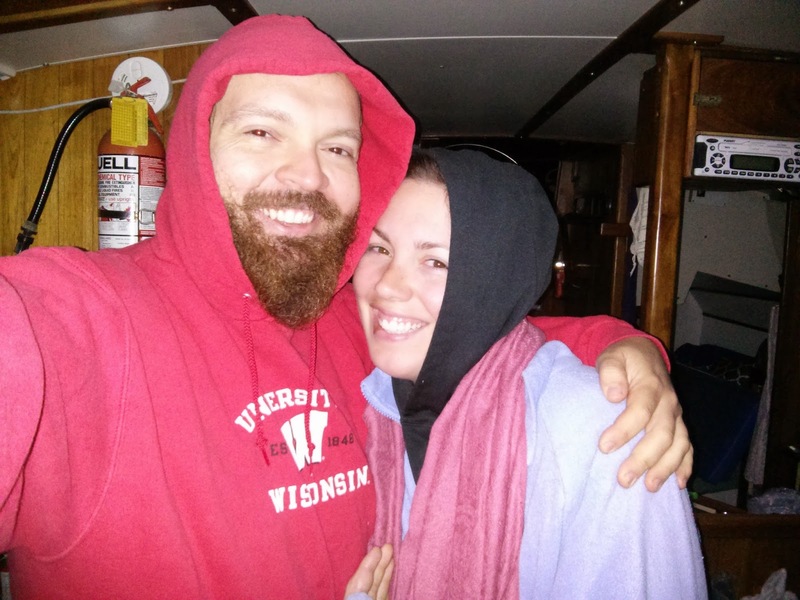 Caitlin and I met in an online sailing group and had kept in touch. Thankfully we hit it off! There are also two resorts at Gloucester Passage with restaurants and pools that are very cruiser friendly. We came in with most gorgeous sunset but we were too busy anchoring to take photos, though I did contemplate how I might manage running to get my camera. We bought Aquabat from the man who built her 22 years ago. We had no reason to change her name and nothing better to change it to so we stuck with Batty. As we were sitting in the cockpit one morning anchored off the resort, a man sailed by and yelled out that when he was a young backpacker, he had sailed across the Indian Ocean on Aquabat. We have encountered this type of thing a fair bit as we have come up the coast and it's kinda cool to collect these stories about Batty's history. From Glouchester Passage we headed off to Bowen to pick up a very special passenger! So we left Port Clinton headed for Pearl Bay. I was pretty keen to give it a miss but Bryce was insistent (and does not let me forget it) but thank goodness he was. Pearl Bay is so far one of the highlights of our trip so far. Just open your imagination and I will do my best to try and describe how we were welcomed into Pearl Bay. Our sail up was gorgeous. Deep blue water, majestically rocky shores, dolphins, it was wonderful. The entrance into Pearl Bay is a tight channel between rock cliffs on both sides. As we entered, I was standing up on the bow of the boat keeping a look out for boomies (isolated coral reef heads) and was supposed to point at them if I saw them. Just as we came through the channel, past a deep grotto carved out of the cliffs on our left, a GIANT turtle swam right at our bow! I pointed at it excitedly and quickly retracted my hand as the turtle dove to avoid the boat. Thankfully Bryce missed my brief hand signal and didn't swerve to avoid it. I could see some dolphins swimming in the bay and then all of the sudden the boat was surrounded by swarms of turquoise and chocolate butterflies. Seriously it could not have been choreographed more perfectly! They were everywhere. We put the anchor down and just as I finished putting enough chain out (snubber not yet on) I looked out through the entrance we had just come through and there were five whales jumping up into the air, broaching, splashing and having a marvelous time! We both just stood at the bow staring in awe. I honestly don't think this could have been scripted better and it set the standard for Pearl Bay. The rest of the time we were there, we saw dolphins, turtles and of course the butterflies. Pearl Bay is still in the military training area and so is unreachable by land. All of the other boats left one morning and we were thrilled to have the place to ourselves for an hour before the next boats came in. 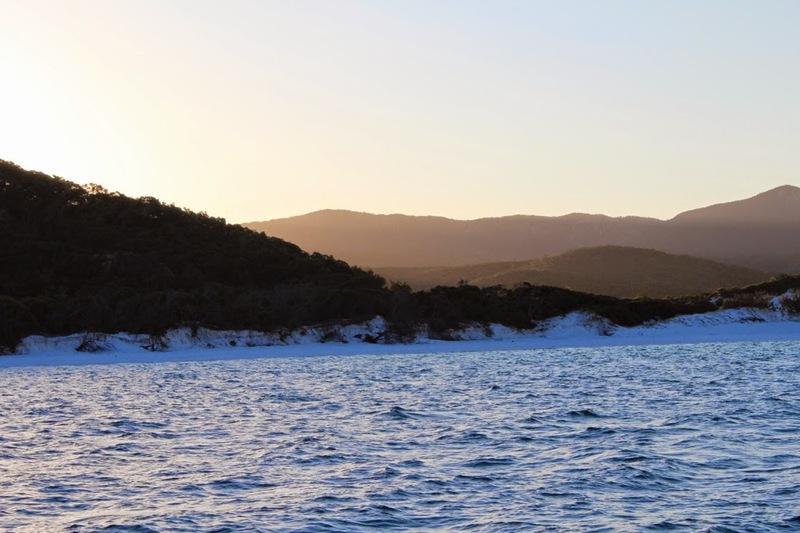 We were so close to the Whitsundays now, we could practically smell them so we made a run for it. From Pearl Bay we went to Middle Percy Island. I wrote about Middle Percy last year and Aquabat's presence in the hut there. We got in too late to go ashore but were able to see the A-frame from the boat.We'd had a long day so it was close enough for our needs. From Middle Percy we headed to Scawfell Island where we had a great night with some Welshmen, Dave & Steve of S/V White Hawk, whom we met at Middle Percy. When we left Scawfell at first light, just as the sun was rising, just 50 feet off our beam, two whales lifted out of the water and breached. It was amazing (and a bit terrifying) to be so close to something so huge and powerful! We had a bit of a photo shoot with Dave and Steve. Each of us taking photos of the others boat under sail. 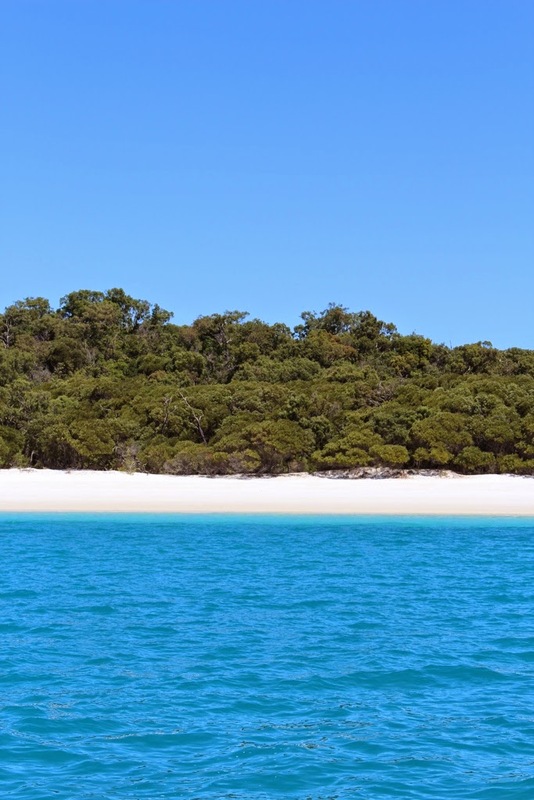 After a full day sailing, we made it to our destination, our shangri-la: Whitehaven Beach. We left Bundaberg early in the morning just before the sun rose. It's really such a beautiful time of day! There is a channel heading into Bundaberg and as we left before the sun came up the channel was lit up like an an airplane runway. We were headed for Pancake Creek with a strong wind warning blowing us along. We had a gorgeous day sailing, averaging about 7.5 knots. Just outside of Pancake there are a series of rock puddles that are not marked. The intention is to go between two of them, which was a bit disconcerting. We did spot them right before we passed them though and we had plenty of space. The rest of the entrance into Pancake Creek is well marked but was a bit hairy. We anchored just as the sun went down. When we woke up the next morning, we were in for an awesome surprise. We could see the bottom and the water was so crystal clear we were able to follow our anchor chain back to the anchor. After the Brisbane River, Mooloolaba, the Sandy Straights, the Burnett River, all murky and gross.... this was amazing! We had made it! We spent a couple of days here before heading on. Can you find the anchor? On September 6th, 2014 we officially entered the tropics by crossing the Tropic of Capricorn. A pod of dolphins joined us in celebrating by swimming, diving and splashing all around the boat. Definitely a most memorable experience! That night we anchored behind Cape Capricorn which was remarkably uncomfortable and rolly. After our last unpleasant night, we are that much smarter and so at 2:30 am after not much sleep we decided to up anchor and move on. Now we have never sailed overnight before so this was still a novelty. We set up a nest in the cockpit with blankets and pillows and dozed until the sun came up. We set an alarm and every 15 minutes one of us popped our head up to check out the perimeter. By leaving earlier we were able to eliminate an entire day of sailing and made it to Port Clinton. 2:30am and ready to go! Now Port Clinton marks the start of the Shoalwater Bay Military Training Facility. It is this amazingly beautiful and ginormous reserve. Sometimes the area is shut for training and even when it is open it is still not permitted to go above the high water mark as there is possible unexploded ordinance around. We were lucky to be there around a full moon so had lots of extra beach to play with because of the extreme tides. It's pretty thick brush though and so not very inviting! While we were at Port Clinton, we were able to to isolate our electrical leak. We didn't fix it but we at least know where it's coming from. I should also mention that we were boarded by the Water Police here. This was a shock to us as we had *JUST* been boarded for sewage and safety checks in Bundaberg. Most people we tell this to are shocked as they have been cruising much, much longer than we have and have never been boarded. And no... it's not us. Every boat in the anchorage was boarded. From Port Clinton, we headed up to Pearl Bay. 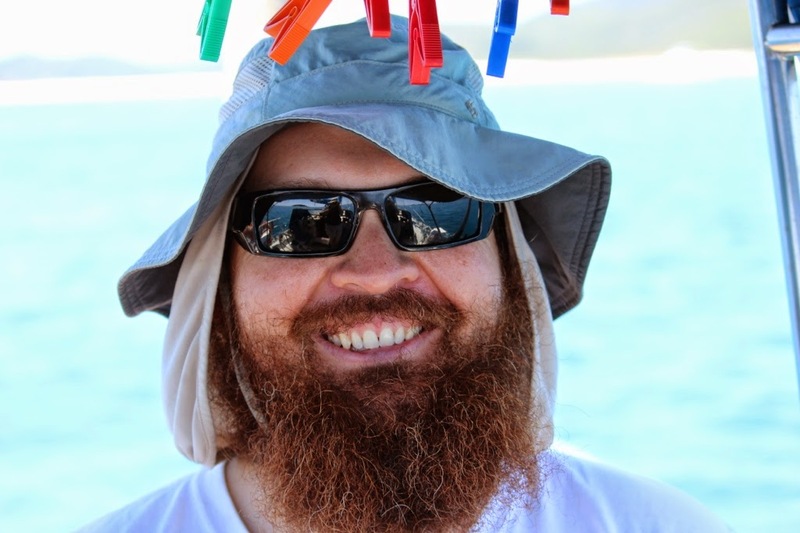 Getting to Bundaberg was easily the most unpleasant sailing experience either of us have has and it took us a day or two to recover. After we got over it, we headed into Bundaberg. We had been planning to take Batty up the Burnett River and anchor in Bundaberg proper. We found however that there was one bus that came out to Burnett Heads just a short walk away and so we decided to spare ourselves the trouble. The first bus leaves for town at 7:30am-ish and the last one leaves town at 3pm-ish. Weird hours? That's cause it was the school bus. It was a 40 minute roundabout route to collect kids from all over the countryside. The bus was packed and noisy and we were the only adults on board. 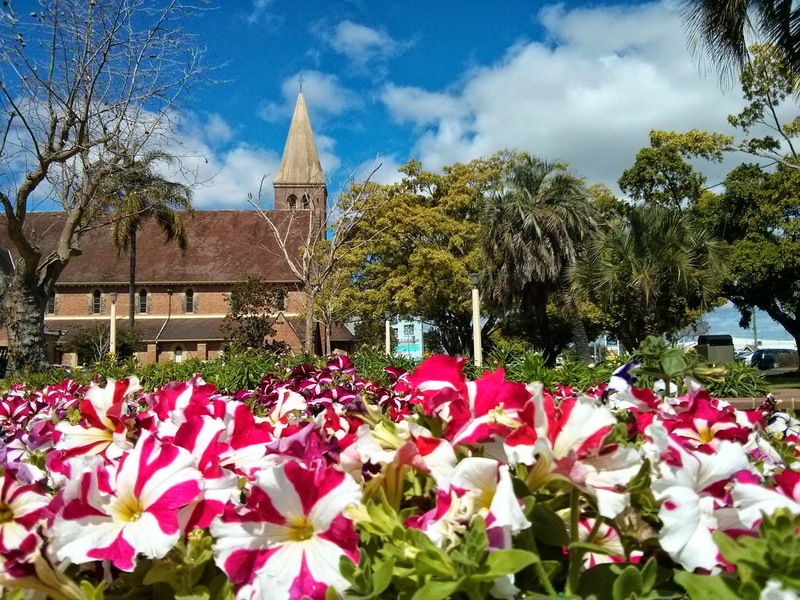 We spent a couple of days meandering around old town Bundaberg and resupplying. It took us a few days to make the connection but we finally figured out the the phone call we got about our anchor dragging was from our friend Mike who was anchored nearby. We had been baffled as to how someone got our phone number! Mike had a car in the area and took us to check out the nearby town of Bargara. We took the opportunity to fill up our fuel tanks at the marina. We had some issues when we discovered that we couldn't get the fuelcap off. *Someone* doesn't know their own strength and habitually overtightens things on board. We did finally get it off with some help. We were relaxing, got our dates mixed up and missed a weather window to leave northbound, but it was nice as we got a few days extra in the area. The day before we left we took the school bus into Bundy again. Last year, Bundaberg was severely hit by floods where the water rose about 18 metres above the river. They still haven't completely recovered. There is a lovely riverwalk that goes from the old marina under the two oldest bridges and ends at the town "zoo" - Some kangaroos and emu. All of this was under in the floods. We were looking for the visitors bureau which is probably not worth going to if you don't have a car. It was a nice walk but from the zoo we went through the business/industrial area of town. The Tourist Info Centre did have coupons for free smoothies at the shopping centre and discounted tours of the Bundaberg Rum Distillery if those are on your agenda. 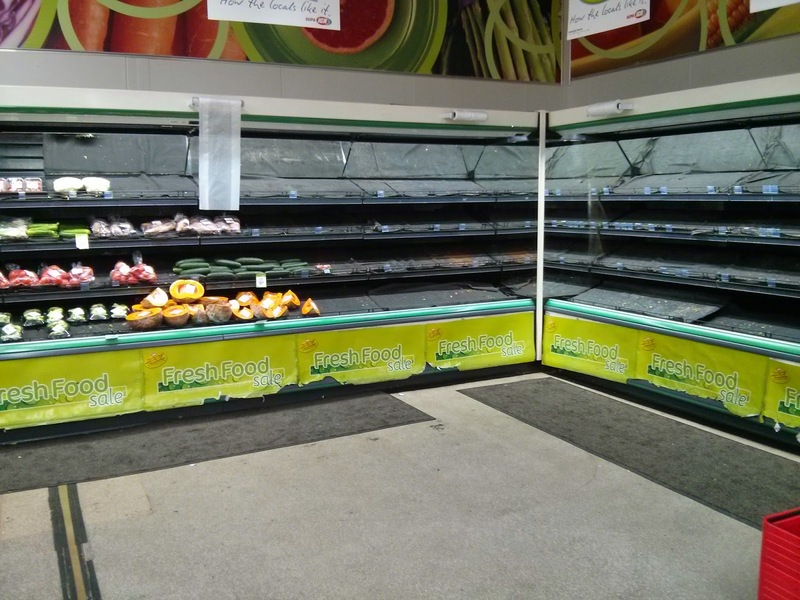 We caught an IGA's going out of business sale and it was very eerie to be in a shop with practically empty shelves. All stocked up we were ready to continue north.